NIC employee experimenting with a virtual reality headset. Let's face it. The government isn't often a poster child for embracing cutting-edge technology. More often, local, state and federal agencies are chided for being the last to adopt innovation that could simplify your life. That's where NIC has stepped in. "In general, government agencies lag everyone else when it comes to adopting technology," said Robert Knapp, chief operating officer at NIC. "They only have a certain amount of allocated dollars ... [So] for the last 25 years, we've tried to be the R&D shop for our government partners." NIC is a government contractor based in Olathe, Kansas with 4,500 federal, state, and local government agencies as clients. The "blue room" in NIC's headquarters in Olathe, Kansas. A bulk of NIC's early work focused on building digital services for state agencies. 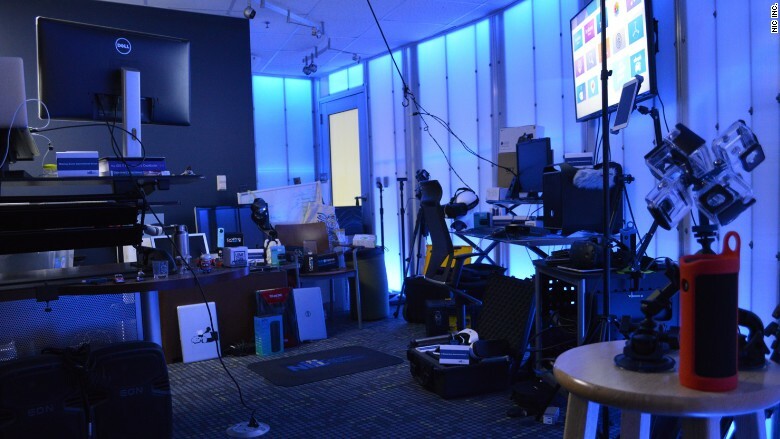 Although NIC has offices in 30 states, much of the core innovation happens in its home office in what's known as the "blue room." It earned that moniker from the blue-painted walls and blue track lighting. 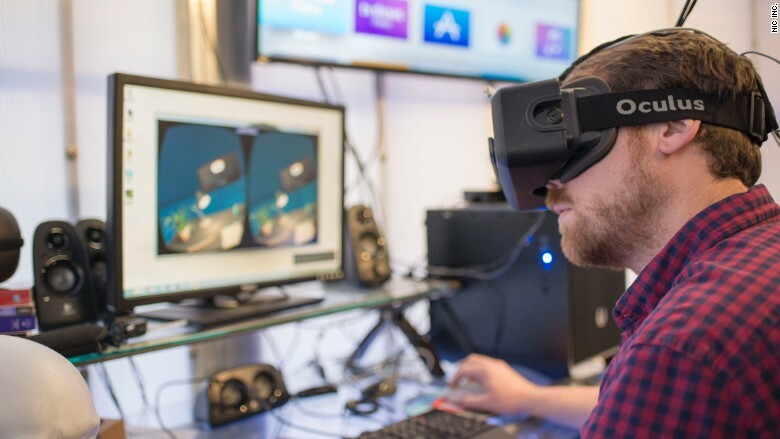 It's filled with the latest tech gadgets, everything from smart devices to VR headsets to 360-degree cameras. "There's always a resident technologist there playing with the coolest technology," said Knapp. "We're constantly evaluating how it can be used to make the government more accessible to people." Apps might not seem like a huge innovation, but it's a significant technological step for the government. For instance, NIC developed the government's first native mobile app for Apple's (AAPL) iPhone. "It was a practice driver exam app for the state of Utah. Now 12 other states have launched this app," said Knapp. Last year, the firm launched the government's first app for the Apple Watch. "AccessDNR" was designed to help outdoor enthusiasts locate water trails and boat launch sites in Maryland. 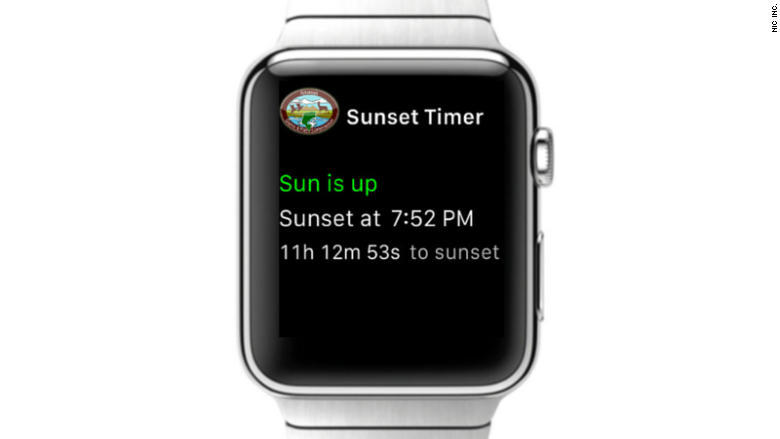 Another Apple Watch app showed Arkansas residents sunrise and sunset times, which Knapp said was geared toward duck hunters who are only allowed to hunt during certain times. NIC developed a sunrise and sunset app for The Arkansas Game & Fish Commission to help hunters see when it was offically time to hunt. NIC also launched the Gov2Go service in Arkansas, which 136,000 people have signed up for. It builds a calendar of all your government interactions throughout the year and then sends alerts when deadlines are approaching for things like property tax payments and vehicle registrations. When people complain about the government, one gripe always tops the list. "People don't want to go into a government office unless it's absolutely required," Knapp said. So NIC is working on solutions like using virtual reality to let someone to make a courtroom appearance without having to be physically present in court. They've already utilized that technology in Indiana, where a Google Cardboard headset gives a virtual tour of the state house. "In Indiana, the state house gets 50,000 visitors a year," said Knapp. "We created a way to let people take a portion of the tour in virtual reality instead of going there." NIC is also utilizing Amazon's (AMZN) voice-activated assistant Alexa. In Utah, you can use Alexa to take a practice driver's test. In Mississippi, people can ask Alexa about things like the state flower or the state bird. "What we've seen is that government is willing to embrace technology," said Knapp. "Their struggle is having the money to do the R&D. As a private company, we can do it on their behalf."